This weeks inspiration photo for The Card Concept Challenge is so gorgeous, I predict a large gallery of beautiful cards featuring this very popular subject. Have fun with butterflies. Here is my card inspired (rather directly) by the inspiration photo. For some reason ( I am not a very well informed photographer) my image proportions are shorter and wider than the actual card. I will have to get to the bottom of this?? I am sure my mirrors do this to me as well!! 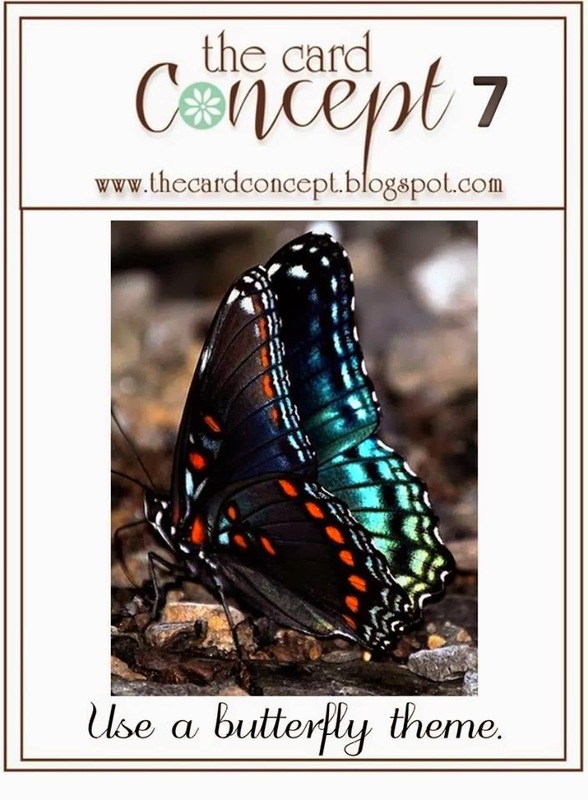 When I looked at the inspiration image, the elements that popped into my mind were the butterfly (hmmmm! ), wood grain, trellis and curly cues. I added a light splatter of turquoise ink (still trying to control those little suckers) and a few wee sequins. The button with twine and the two studs from Prima finished the card off. I am not sure who the butterfly is from. Its an old set of red rubber cling stamps. The trellis is Spellbinders and the sentiment is Hero Arts. Have fun creating over the next two weeks. Stay safe. I really get excited when I see your cards in my reader Karen. It's always such a delight to visit. Always inspiring. I LOVE how you did the trellis on this card Karen...honestly, one of my favorite cards...freestyle collage is such a fun style! Oh my goodness that butterfly is so pretty! The whole card is just stunning Karen! I love the colors you used too. The black really makes it! Love your background too! You have captured the butterfly in the inspiration photo beautifully, Karen! Perfect splatters along with everything else to make a gorgeous background! Ooh! You sure captured the butterfly in the inspiration photo to a "T" ! I love the butterfly paired with the trellis and greenery. Very nice! So pretty with the woodgrain and partial die cut trellis! This is such a stunning creation, that I have no words to describe it - other than to say I LOVE it!